Also serving communities of Chanhassen. There are 37 Assisted Living Facilities in the Chaska area, with 3 in Chaska and 34 nearby. The average cost of assisted living in Chaska is $5,560 per month. This is higher than the national median of $3,346. To help you with your search, browse the 101 reviews below for assisted living facilities in Chaska. Better rated regions include Shakopee with an average rating of 4.5 out of 5 stars. Caring.com has helped thousands of families find high-quality senior care. To speak with one of our Family Advisors about assisted living options and costs in Chaska, call (855) 863-8283. Chaska is a scenic River Valley town in Carver County, located on the edge of the Twin Cities Metro area. Within Chaska, there are three Assisted Living Facilities (ALFs) and an additional 54 in the surrounding area. 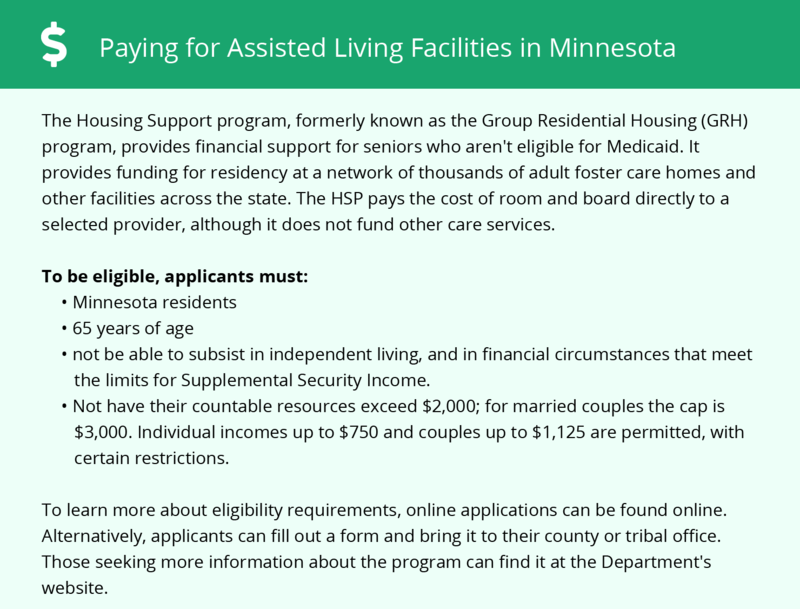 ALFs in Chaska and all of Minnesota are also referred to as housing services and are licensed by the Minnesota Department of Health. The cost of living in Chaska is 17 percent higher than the national average. Seniors who are trying to save money may have a difficult time in this area. Seniors who are bothered by the cold should know that Chaska receives 49 inches of snow per year and has an average winter low of 6 degrees. This may make it difficult for those with limited mobility to stay active during the winter. The Chaska area is home to world-class medical facilities, including Two Twelve Medical Center and the Ridgeview Chaska Clinic, in the event of medical emergencies or illness. Chaska has an array of community resources for seniors, including the Senior Linkage Line, a free hotline that offers statewide information and assistance to seniors in all 87 Minnesota counties, as well as three senior centers. The Chaska area is home to many wonderful museums such as the American Swedish Institute, performance venues and athletic events. The Lodge in Chaska takes older adults on day trips to experience the sites of Chaska and the greater metro area. Assisted Living costs in Chaska start around $5,560 per month on average, while the nationwide average cost of assisted living is $4,000 per month, according to the latest figures from Genworth’s Cost of Care Survey. It’s important to note that assisted living rates in Chaska and the surrounding suburbs can vary widely based on factors such as location, the level of care needed, apartment size and the types of amenities offered at each community. 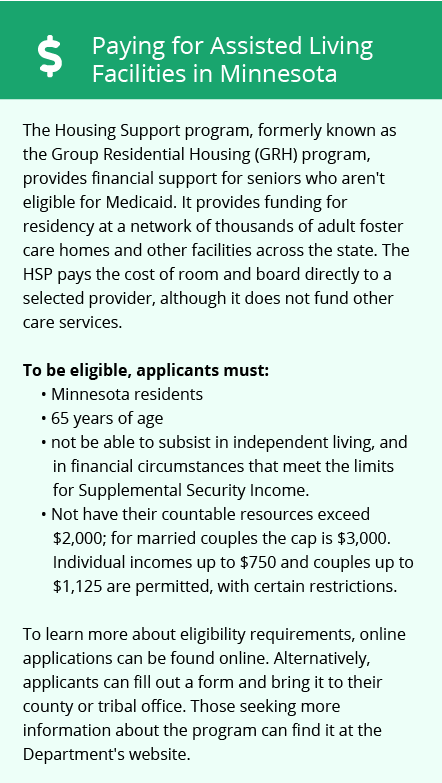 Medical Assistance, Minnesota's Medicaid program, is available to help qualified seniors cover assisted living costs. Eligible seniors may also qualify for one of Medicaid's waiver programs if they need additional help. Chaska and the surrounding area are home to numerous government agencies and non-profit organizations offering help for seniors searching for or currently residing in an assisted living community. These organizations can also provide assistance in a number of other eldercare services such as geriatric care management, elder law advice, estate planning, finding home care and health and wellness programs. To see a list of free assisted living resources in Chaska, please visit our Assisted Living in Minnesota page. Chaska-area assisted living communities must adhere to the comprehensive set of state laws and regulations that all assisted living communities in Minnesota are required to follow. Visit our Assisted Living in Minnesota page for more information about these laws.